Which creative auteur has two thumbs and is obsessed with death? Trick question! It's two creative auteurs! Namely, George R.R. Martin, author of Game of Thrones, and Hidetaka Miyazaki, president of FromSoftware and the man behind Dark Souls, Bloodborne, and Sekiro: Shadows Die Twice. It's no wonder, then, that the pair are apparently teaming up for a new RPG video game, which could be making its grand reveal at E3 2019 in a few months' time. According to an investigative report from Spawn Wave and Liam Robertson, FromSoftware and George R.R. Martin are collaborating on a medieval open world game to published by Bandai Namco, with the former responsible for writing much of the story and lore of this mysterious new IP. In the unannounced, unnamed title, claims Robertson, your main character would be invading various kingdoms throughout the open world, and killing the leaders within, subsequently gaining the unique powers of each in the process. Now, it's unclear who Spawn Wave and Robertson are getting this intel from, and whether there's any basis to the claim, but the latter does hold credibility as a reliable source for leaks. We already know that FromSoftware has two games in development following Sekiro, and while many are hoping for Bloodborne 2 or a Demon's Souls remaster, it's not implausible that the studio is working on something entirely new. 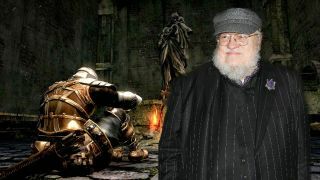 This rumour would also explain why Martin has still yet to finish The Winds of Winter, the upcoming sixth instalment in his Song of Ice and Fire book series, as he's knee deep building out video game lore for an altogether different kind of writing project. If you're currently struggling with FromSoftware's latest, check out our Sekiro guide for a complete walkthrough to beating the game without destroying your controller in rage.